As of writing, the legendary Cupertino company - Apple Inc. - is enjoying the biggest and profitable quarter out of any company in the history of this planet. According to TechCrunch, "Until today, Russia’s Gazprom (the largest natural gas extractor in the world) held the record at $16.2 billion in a quarter. Apple now holds the record: $18.04 billion in profit, fiscal Q1 of 2015. Absolutely. Insane. For reference, that means Apple makes around $8.3 million dollars per hour in profit (24 hours a day)." As all Apple fans know, the American electronics giant has a number of products and services providing a steady income stream for the company. To name a few, Apple has the Macbook Air, Macbook Pro, iMac, Mac Pro, iTunes, App Store, iCloud, iPad, iPad Mini, iPod Touch, and Apple Accessories arm -- all of which have give the brand tremendous profit margins and hence, are hardworking enough to make sure that Apple stays not just afloat but on top. This leads one to ask, "Of all of these stellar devices and services, which ones actually gave Apple its best quarter ever in terms of profit?" Well, to quote The Week UK, "The success of the iPhone 6 and a huge rise in sales across China has propelled Apple to the largest quarterly profit of any public company in history. [...] The company sold 74.5 million iPhones in the period – another record for the company. Apple does not break down sales for individual iPhone models, but analysts believe that the company's performance was driven by a surge in demand for the larger screen iPhone 6 and iPhone 6 Plus models. The higher price of the new phones led to a two percent rise in the gross profit margin to 39.9 percent." 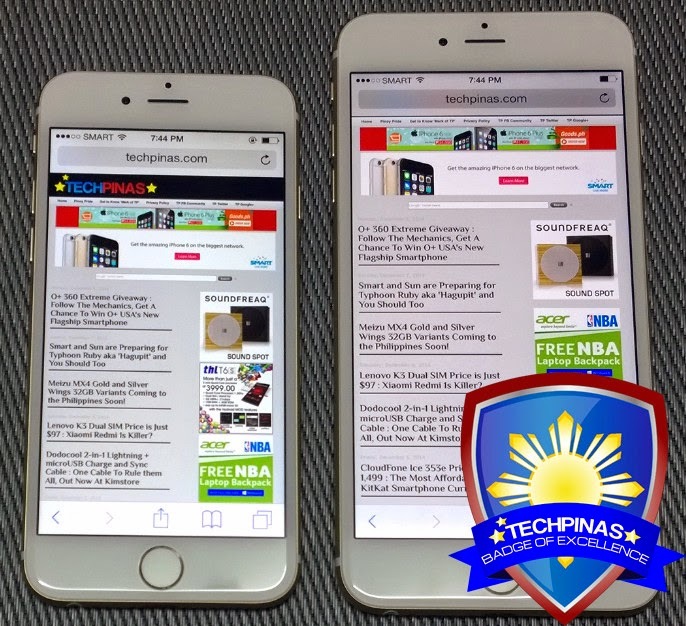 The TechPinas Badge of Excellence Awardees, 4.7-inch Apple iPhone 6 and 5.5-inch Apple iPhone 6 Plus phablet, respectively. In September 2013, Apple launched the metal-clad iPhone 5S and the candy-colored iPhone 5C -- both flaunting a rather small 4-inch display. Of the two, the more premium release was more successful, outselling the 5C by a two-to-one margin during launch. The Apple iPhone 5S - especially the Gold variant - went on to become the top selling smartphone that year (beating even Samsung Galaxy S4) according to Counterpoint Research. 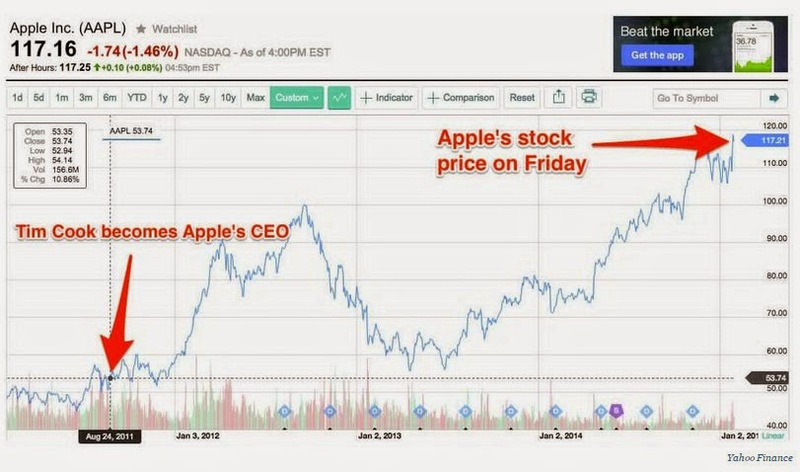 Nonetheless, despite its unquestionable market performance, the 2013 flagship failed to sharply turn things around for Apple following the stock price slump months after the launch of the iPhone 5 in 2012 -- as seen in the graph above. So what exactly was in iPhone 6 and iPhone 6 Plus that made it possible for Apple to surpass its previous profit highs? What made it these 2014 models a bigger hit than all of their predecessors? Respected global research firm Kantar World Panel offers a clear and eye-opening explanation, "At the point of sale, when asked what drove their choice of smartphones, 58% of those surveyed who bought an iPhone 6 Plus said screen size was the primary reason for choosing their device. Despite the more compact design of the iPhone 6, 60% of consumers who chose it also cited screen size as the primary purchase driver." Crystal. Their larger displays obviously made them all the more attractive to a lot of consumers. So I guess we can say that - at least, in the case of the iPhone - bigger is indeed better. In fact, according to BGR, "Where iPhone sales are concerned, Wall Street was expecting sales to total 66.5 million units for the December quarter thanks to unprecedented demand for Apple’s new iPhone 6 and iPhone 6 Plus. Actual iPhone sales came in at 74.4 million units during fiscal Q1, which is also a quarterly record for Apple. In the same quarter last year, Apple sold 51 million iPhones." Congratulations, Apple! Great job, Tim Cook! I'm so happy with both iPhone 6 and 6 Plus; I'm greatly looking forward to what's next.